One of the first things I do when I begin working with a kid that has a limited diet (aka: is picky) is to make a list of everything they actually eat. I do mean everything, including sweets. Sometimes this is a very short list, that’s ok. If it is very short, I also write down some of the things they eat sometimes or have at least tried. You will be surprised how helpful it is to see it all down in front of you. In some cases, it makes people feel better because you realize your kid is actually eating more than you thought. In other cases, it can make you feel worse if there are only a few foods on the list. I don’t want to make you feel worse, but in the long run it will help improve the variety of what they are eating. Once you have your list (make sure you really think about everything), start brainstorming other foods that are similar to the ones on your list. Then write down the ideas next to the food. For example, let’s say raisins are on your list, then dried cranberries would be something I would write down next to it. Okay, stay with me here, I am going to give lots more examples in a minute. 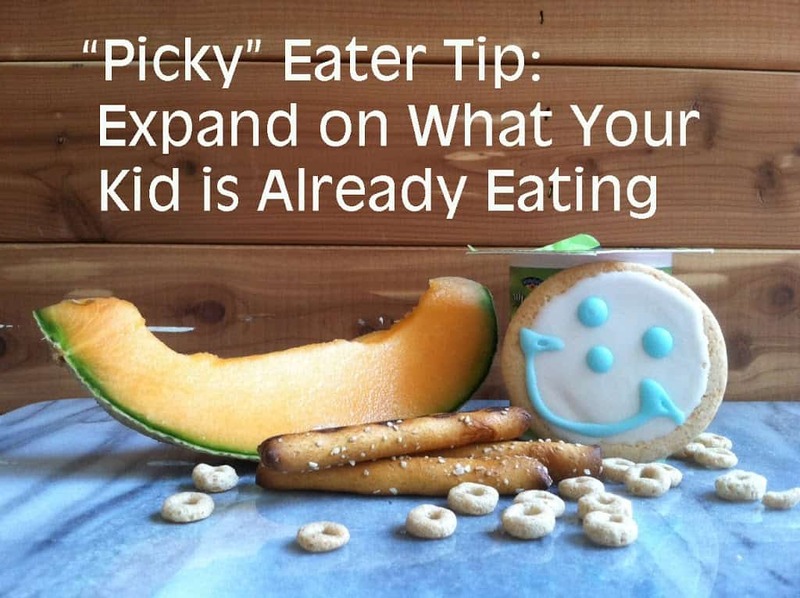 If your child is a very “picky” eater then you are going to want to keep the foods as similar as possible. 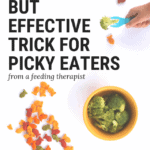 Although, don’t let this limit you, it is still good to expose your “picky” eater to a large variety of foods, even if they do refuse them – it is not a waste of time. I have been having a lot of difficulty getting my 10 month old to eat, transitioning to food at all has been difficult. We are focusing on table foods at this point and I haven’t quite figured out why he is refusing so many foods. When I was on the brink of meltdown this week (after another refused meal that I put a lot of effort into) I turned to writing my list and it has really helped. Here is a pic of the list I made for Isaac. Notice I don’t have ideas for every single food he eats, but I have enough to get me going for a week or two. If I am still struggling then, I will revisit this and try to come up with some more ideas. I don’t want to mislead you here, and you are probably already thinking, “That’s great, but my kid isn’t going to eat dried cranberries.” They very well may not, well, at least the first time you try anyways (check out Try and Try 12 Times for more on this). There is some reason your kid feels comfortable eating pretzels, cheerios, cookies, or whatever it is for your kid. Changing it up slightly is more likely to go over well than changing it up a lot. The more familiar the food is to them, the more likely they are to give it a try. It is important to remember all of the Basic Strategies I have shared, too, and use them in conjunction with this tip. Especially, making sure you have another preferred food available. If you are taking raisins away, and changing it to dried cranberries, then they aren’t a preferred food until they eat it, so make sure you serve the new food with something that is comfortable. Also, you don’t necessarily have to point out that the food is different, but don’t try to trick them either (They aren’t really going to expand their variety if they think they are eating something else). At the same time, you may lose some kids if they bite into something expecting it taste like something else. Kids can get distrustful fast, especially when it comes to their food. You will have to use some trial and error and see what is a better approach for your kid. The main idea is to give you more ideas for new foods to try. Once they have started eating some of these foods that are slightly different you can change it slightly again. For instance, Isaac barely eats yogurt, a staple in our house. If I can get him eating banana yogurt (because he likes banana so much), I can slowly introduce other combinations like strawberry/banana yogurt and then ultimately just strawberry yogurt. It’s like you are slowly transitioning them into more foods by using the foods they already eat. Does that make sense? I know this one is a little complicated, but I wanted to share it because I think it will be very helpful for those of you that are struggling with increasing food variety. One last thing. Take a look at your list on the whole. Does anything stand out? Sometimes there are patterns that may give you some insight about how your kid is selecting food. For instance, all the foods may be white or tan in color, mostly crunchy, or very soft. Take note and use that as your starting point. If all the foods are tan, try other tan foods you can think of first and then slowly change the color. Again, I hope I am not losing anyone here. I am getting into some therapeutic strategies here. Please, ask questions! And, let me know how the lists are going! Also, don’t forget to subscribe to my email list, I don’t post often, but when I do, I share valuable tips that can help your little one with eating or sensory processing. The sign-up is below and at the top of the right side-bar. Aww, thank Vanessa. You’re so welcome! Hi, Thank you so much for all of your helpful information! My son is almost 8 and is a selective eater but us slowly trying more things. I think his eating choices are impacted in part by his large tonsils. We’ve been to an ENT and they are following him but do not want to remove them at this point. His dentist is also following him and was the one who told us about the connection between selective eating & large tonsils. When I look at his preferred foods, it definitely is more about texture vs. flavor. Since his tonsils are not going to be removed at this point, do you have any thoughts? There is a big connection. First, make sure you have your routine and positive environment down. That foundation will be critical. Second, I’d try to expand on the textures he prefers. If he likes soft or pureed foods that may be because it is easier to swallow, but whatever the texture I would try to build off of that. Search for “expand on what your kid is already eating” in the search bar or see the article index in the menu bar. That post will be really helpful! I am very glad my search for a perfect sippy cup for my baby got me in here.. A wonderful insight of the problems and answers I need in the current phase of parenting.. Thanks for all the wonderful tips…. Could you please help me by suggesting the amount of protein n carb n vitamins an 19 month old need..
How many times he much amt of milk to be given in a day..
Hi, Toddlers need 16 ounces of milk a day. I don’t know the protein and vitamin amounts, can you check with his doctor? Thank you so much for you lovely comment. Let me know if you need more help! Thank you for putting all this info out there for us! I’ve been following from Pinterest and have gotten some great tips. My daughter though is 2.5, and is so limited in what she eats, we have to constantly take her food with us where ever we go still! I went through and made a list of foods that she eats, and the consistent trend is that they’re mostly soft…baked beans, cottage cheese, peanut butter, yogurt, eggs, and macaroni & cheese. She’ll eat fruit on top of that (no ‘crunchy’ fruit, like apples), but that’s about it. I know she’s getting most of the nutrition she needs, but I’m exhausted always having to make 2 separate meals! I always try to give her a ‘preferred’ food, 1 side I know she likes, and 1 that’s new – but she won’t touch it. Do you have any other suggestions on how to help them branch out some more? Dear Alisha, my 2.5 years old daughter has been a very picky eater. She likes all milk products but that is all that she would want to have all the time. Her day starts with milk and oats. In her daycare she eats better than at home. However at home she is very fussy and would not want to try anything new. Some of the things she likes are sweet yogurt, ice cream and chocolate biscuits. A month ago she used to have rice and daal at home but does not want to have it now.There was a phase where she was reluctant to move to solid foods from mashed baby food. After a lot of attempt she finally moved to eating Rice and Daal which is very rich in protein but of late she refuses to eat that. 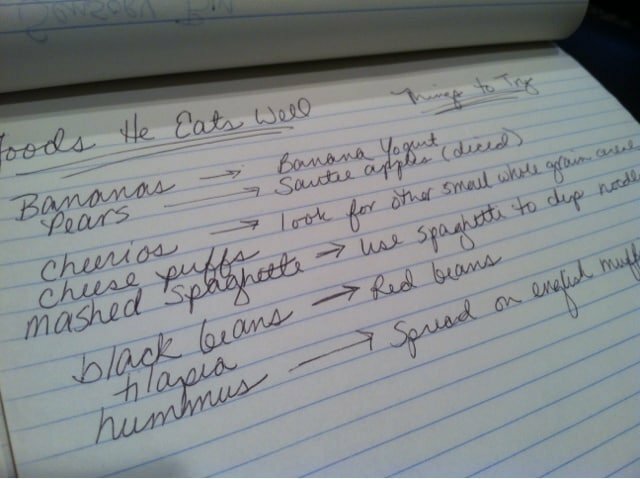 I went through your post on how to make a list of items that the child eats and walk your way through in identifying what would work well with the child and I must say I am motivated again to try some new strategies to make my daughter try new items. She has a history of illness and we have had to give her a lot of medicines in the past. I must admit that at times we had to force feed her which I now realize has been a mistake. Her first reaction to any food is a clear no but if I somehow make her taste it and if it is of her liking then she is completely fine. Due to her eating habits her wait is slightly on the lower side in comparison to the weight of children her age. Both my wife and I am really concerned about her eating habits. We visited a number of pediatricians but all of them say that this is a passing phase and that we need to give the child sometime. I however feel we are going wrong somewhere in our approach. I will be very helpful if you could give us some ideas on how to make my daughter try new foods. Hi Neeraj, I understand how difficult this can be. The best thing I can tell you is that one, it takes a lot of time and consistency, and two you will need to use a variety of strategies to move forward. I would encourage you to go through the article index in the menu bar and begin reading the picky eater articles (there are a lot!) You will find lots more strategies. Make sure you read exploring new foods, in that post I talk about getting your child to interact with food in new ways that they control, such as touching or smelling. You can also look at eating basics in the menu bar, which is a great place to start. Lastly, try to take all pressure off her. Approach it in a positive way. Once you’ve read some of those other articles let me know if you have any questions. I read through your articles and tried some tricks. I started with Oats and Milk which my daughter eats well. I started mixing small portions of Wheat Chapati which she eats fine but I have seen that the trick on no force feeding and allowing her to eat what she eats well is NOT working with her. In fact we feel it has deteriorated the situation. Now my daughter eats only Oats and milk and would not mind having the same all day long. She has stopped eating at her creche and is surviving the entire day with a few biscuits. We are really very concerned and wondering if we should try force feeding her again because in the past that has worked. We had to make a lot of effort and let me tell it was not pleasant at all but gradually she had started eating rice and daal. I some how know for sure that force feeding is not good as my daughter “Avani” is growing and can now understand a lot of things and we do not want to make the entire meal time a horrifying experience but somehow letting her eat what she eats well is not motivating her to eat well. It appears she is turning into a Problem Eater from a Picky Eater. Avani is a darling at all the other activities. She is very active and is a very fast learner. It is only her food habits that is very concerning. While I was pondering on other options, I remembered that you had very promptly responded to my last query. If there is anything – a tip or suggestion that you think would work for us, please advise. I would be very grateful to you if my little one picks up on her eating habits. I totally understand where you are coming from and your concerns are very legitimate. However, I can’t recommend a child be force fed in any instance. Please understand that you are doing daughter a lot of good by not force feeding, but that doesn’t mean that she is suddenly going to have an appetite. Any child that needs force feeding to eat enough is a problem feeder, although I understand you think it is getting worse because she has become more limited when left to her own devices. Are you in the states? How old is she? If not in the states is there any option for her to get professional help? I would strongly recommend getting some help because I’m sure that she has some underlying difficulties that need addressed. This is not a push for my own services, but I am also available for consultations where I would give you a full individualized plan, which is what she needs. 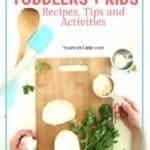 Otherwise, generally speaking… try to keep mealtimes down to 30 minutes, eat with her, have her play in a variety of textures outside of mealtime, encourage her to touch and explore (by demonstrating through play: oh look my apple slice is a little boat floating around my plate, etc.) foods, and give her different foods even if she doesn’t eat them regularly on her plate. Please let me know if you need anything else! Hi Toya, have you seen the two articles I have on Transitioning Your Toddler to Table Foods? You can find them in the article index in the menu bar. They are very detailed and will give you a clear plan. If you have any questions after reading those don’t hesitate to let me know! I love all your blogs they are super helpful thank you. I have a 13 month old boy and he isn’t picky but he Is limited on what he can eat he only has his bottom two teeth in the midst of getting his top two but he hasn’t quite gotten the mashing up more harder foods like noodles and stuff like that but he eats crackers oatmeal baby food just fine just not 3rd foods because of the chunks. Is there anything else u can recommend for him to eat? Hello and thank you! I just wanted to say we are so grateful to have you and your awesome information! We have been following your “plan” for table foods (puffs, graham crackers, town house) to the T and have seen great success! Our babe is 10 months and is making steady progress. She never really took a spoon (yogurt only!) but loves the pouch, too, so I make homemade ones with yogurt, steel cut oats and usually a veg and fruit (usually avocado, BN squash or sweet potato and pear/apple or banana). They are chunky and full of texture. Oh Megan you are so sweet! You both are doing great, and graham crackers are not the worst thing. I love how you’re handling it, and yes trust her. I would recommend trying to build on what she is eating, so make small changes and present foods that are similar- like I describe in this post. Also, don’t overly cater, just to get her to eat. Have you plan of what your going to offer (try to include things you are eating as appropriate) and stick to it. She may have some meals that she doesn’t eat well at, that is okay and normal. If she gets the impression that you are going to always get her favorite then she will work that angle. That being said, always make sure she has at least one preferred food! Let me know how it goes! Thank you…even me just writing this you helped me reflect and synthesize. That night, I made her a tortilla with cheese (preferred) and she gobbled. I tend to get overly ambitious (beans, cheese, oregano, avocado!) and then forget that she is 10 months old and it’s all so new! really good point about the catering. She isn’t starving, that’s for SURE! Thighs for days! Thanks again; I will update you in a couple weeks. My son is 5 years old. By what i read i know he is a problem eater. He does not eat meat at all. His main meal is waffels and Danimal Yogurt.I tried to introduce different meals but when i put something else on his plate he will not eat anything at all. He sniffes everything and gags when he sees the food we are eating. Also he does not like when someone is looking at him while hes eating. Not all the time but often. He will make up anythin the food is too cold than too hot, it does not smell good, it does not taste right. Any tips? Thanks.! I would have to agree that he is a problem eater. There is a lot of information on this site, which I know can be overwhelming. Take your time and start at the eating basics tab in the menu bar. Then, see the posts listed at the end to get started. If you are still looking for more, I do offer consults to help with your specific situation- also see the menu bar. Hi! I am so glad I came across your site! I have a 23 month old son who I have so much trouble getting him to eat foods out of his “comfort zone”…and it’s weird because at daycare he will eat foods that at home I can’t get him to touch! We have a lot of problems with weight gain due to health problems, he has a Primary Immunodeficiency and due to illnesses & hospitalizations will sometimes go an entire week without eating anything at all. I’m going to start using your tips & tricks and hopefully we can get him to start expanding what he’s eating when he’s healthy to offset the periods when he’s ill. Thanks for all the helpful information!! You are quite welcome, there is a lot here. Make sure you see the article index in the menu bar if you haven’t already, best of luck! Hi, love your response to the rules, but I have a question regarding eating as much as they want.my 4 1/2 year old has a very fast metabolism. Even if eating lots she struggles to keep her weight,but she is easily “tired” of eating or she eats very little at school.3 weeks into the term she has already lost some weight. At home she often becomes distracted. We try to ‘re-focus her to finish her meal, but it’s becoming a chore. I am happy to send her to bed, but daddy breaks rank and would cuddle her and feed her. A bedtime snack is fine, try for high calorie shakes or smoothies if she will go for that. Try to space out the meal as far from dinner as possible and don’t make a rule that she won’t get a snack because then she will realize you guys aren’t serious about following through. Small frequent meals are the way to go. I realize the link above is a few years old but I am interested in it’s content if you have a new link to provide. It looks like the author has deleted the blog. See the article index in the menu bar here for lots more articles with specific tips and strategies. Well, first I would say that if you are happy with your child’s eating then do what works for you. However, ideally I like everyone to be eating the same thing. This gives kids the best chance for eating a larger variety of foods and forming healthy eating habits, assuming you are eating a large variety. I am not a big fan of kid’s food because it can be really limiting and often not very nutritious. If you want your daughter to eat more of what you are eating then slowly put these foods on her plate and encourage her to taste them. It will take some time since she isn’t used to eating them. I hope I answered your question! This is a tough spot to be in, so glad you found your way here. As far as texture goes try playing in sensory bins outside of meal time, see my most recent post for ideas on this. Also, encourage self feeding and allow him to get as messy as possible. It would also be great to give him some things to mouth on that will break down some of the oral sensitivity. For instance, a large, raw carrot. The intent isn’t to eat it, in fact you don’t want him too. This should help teaching him how to manage solid foods around in his mouth! Hope this helps! Stay in touch, let me know how it is going! Just came across this…so helpful! My 14 month old is still hanging on tightly to the pureed baby foods, much to my frustration. But I can tell he is beginning to branch out. Any tips for a texture-related issue?